Send us your .jpg's pictures or even .mpg's movies of your Johnny Bucket in use. 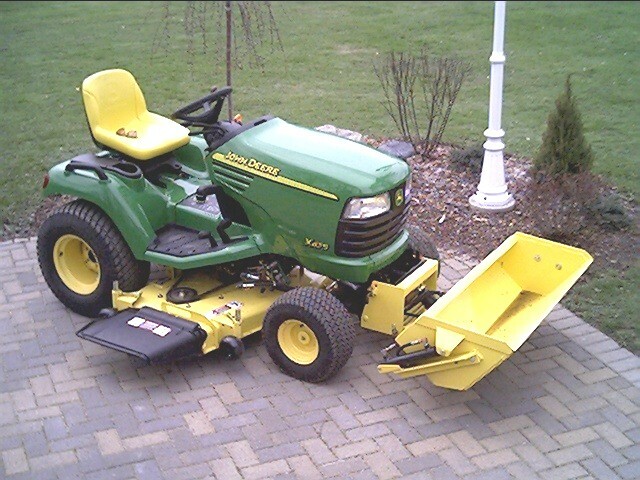 The attached pic shows mower deck and bucket installed. I intend to leave the bucket on the tractor most of the time since the tractor seems to carry it well. The deer waiting for it's Deere taxi No lifting necessary. Just lower the bucket and slide it in. An easy ride up to the bluff. Great job Sharon! The deer in it's new home up on the bluff. Finally got some of the famous Pacific Northwest "sun breaks" this morning after many days of rain. 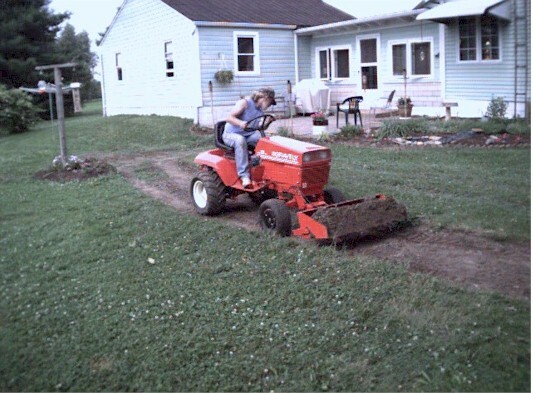 It is far too wet to dig in the dirt with the JBSR, and we haven't taken delivery yet of the next 24 yards of cedar chips, but that won't stop Sharon from getting something done in any brief good weather that we get here in the winter. You can see from the photos that we had a concrete deer statue which weighs about 120 lbs. 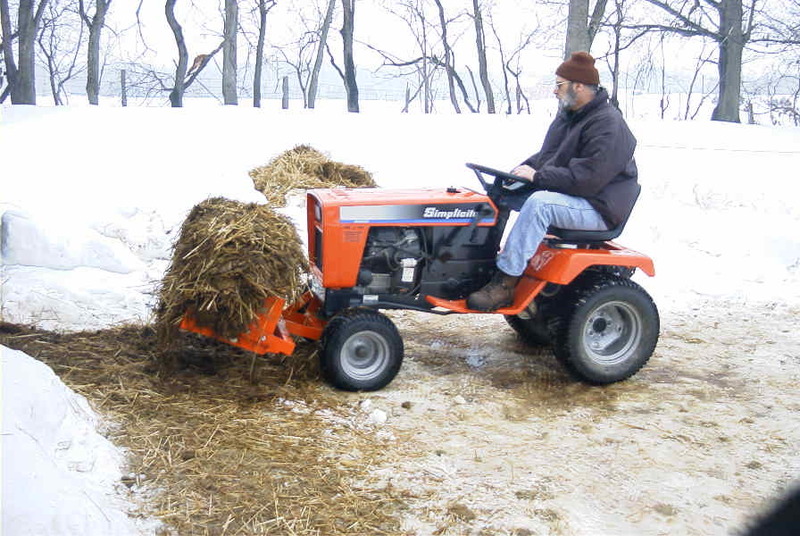 Sharon determined that the best location for it meant that it needed to be moved to the uppermost part of the acreage. No problem at all to do that with the bucket to help... Just load into the bucket (we used some scrap cardboard to pad the statue) and lift it up and take it up the narrow, inclined paths. When we got to the location, we just slid it out of the lowered bucket. 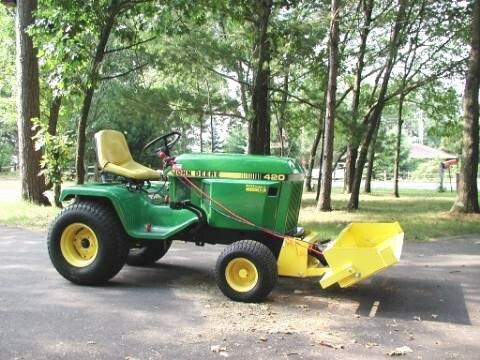 No wheelbarrow or yard trailer could have come close to being this easy...and what a great feeling of a job well done, even in the short time we get to be outside any given winter day here in the Portland area. 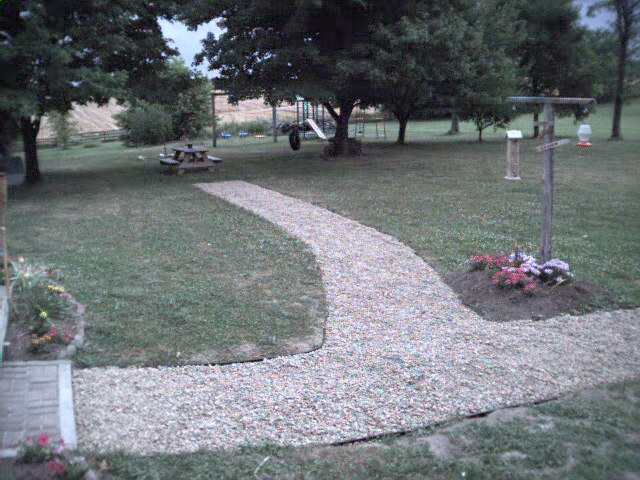 I threw in a wide shot of the area in the yard where the deer statue now rests to indicate how the landscaping is coming along. That's it up behind and to the left of the Gazebo. Thanks again for making such a delightful to use product. Sharon was already the type to attempt anything, now there will be no limit to transforming her creativity into reality around the property. Nice work Sharon. Keep the pictures coming. Charlie S. has found all kinds of uses for his new Johnny Bucket. This was probably a mistake-when I go in their pen to scoop compost, I can't keep them away from the bucket! Today I used the bucket for lots of things that I couldn't normally do, because I can't lift anything much with my spine problems. I pulled up to the coal ash and dog poop can, then just slid them onto the bucket! Before, I would have to lift them into the cart with Barb's help-or like my back is now-not at all. When I get them to the destination, I just lower the bucket, take the lids off, and tip them over-piece of cake! Anyway, I just poked around and discovered all the chores I could do with the unit that I would not be able to do otherwise-(Life is lot's of lifting!). Can't wait 'til Barb gets home to show her all the things I can do now without hurting myself-thanks for the great labor saving invention! 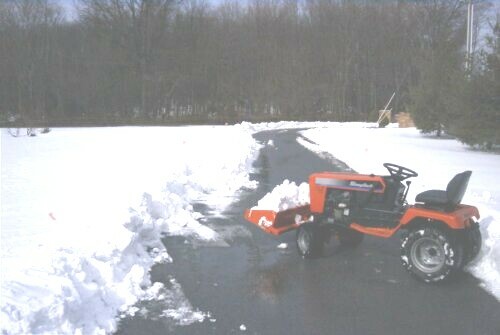 Didn't get much snow, but the wind blew 40-50mph for 2 days and filled in the driveway with hard packed drift 2-3' deep. 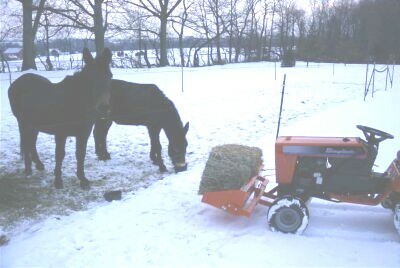 Blower couldn't cut it, 4 wheeler couldn't move it, SO...I moved it one bucket at a time. 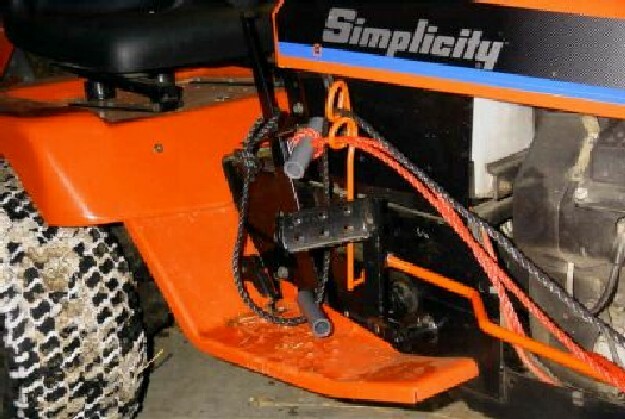 Charlie has even come up with a clever way to manage his control ropes without drilling holes in his shinny new machine. Thanks for all the wonderful pictures and kind words. Keep up the good work! 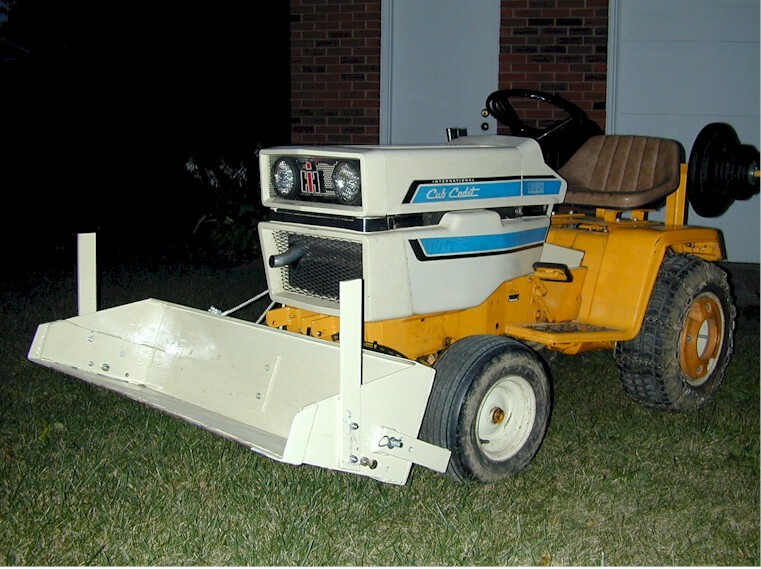 Shortly after Jerry B. received the very first production Universal JBJr, he hooked it up and went out to play. Jerry said that there was a 6" drop off from the garage slab to the driveway. He said he figures he must have moved about a yard of gravel in 15 minutes filling in the drop. As you can see he looks a little cold but is having a good time. Jerry plans on doing quite a bit of landscaping at his new house this spring. Can't wait to see those pictures. Al sent us this note below just the other day. How are you doing? 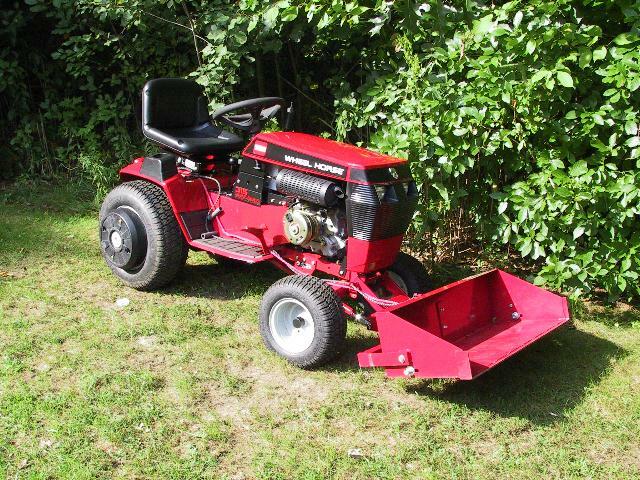 I have a new project for the JBJr. 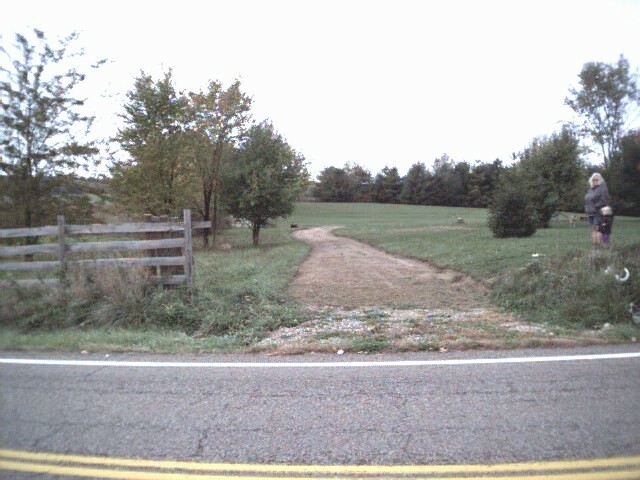 We are putting in a new drive for another home on our property. Made it 10' wide and about 200' long with the tiller. Now my son and I are in the process of taking all the dirt out with the JBJr. I had to let him use it and he loves it. 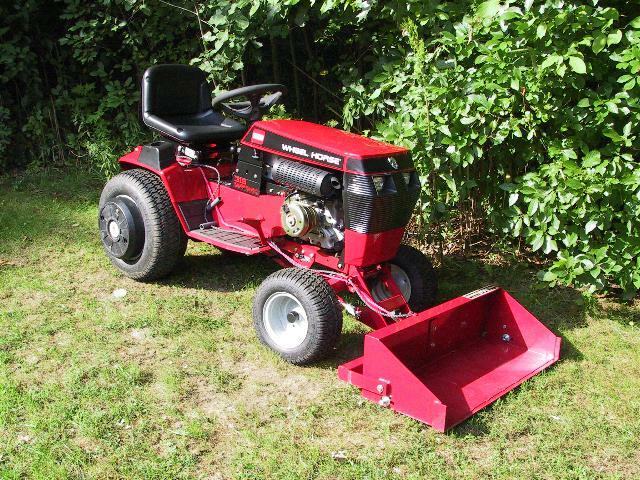 He said, "we don't need a stinking bulldozer, we have the Johnny Bucket". Might take a couple days but is a much more inexpensive way to do it! Thought I'd send a couple pictures of us getting started, will send some more as we go. Looks like Al lost his toy for at least this project. still had some left that I put in a pile for future use. Yes this is like road construction for sure. 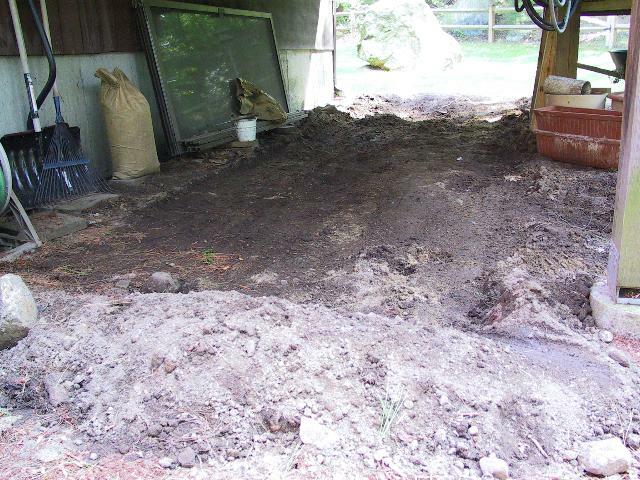 I got a estimate for this from an excavating co. and they wanted $4700.00. Forget that when I have these toys, I'll do it my self. Am almost halfway done with the drive. Got the drive done and ready for gravel. Took about 10 hours total to take all the dirt out. Here's some finished pictures of me and my son Andy with the JBjr and the whole drive. It is 175 feet long and 10 feet wide. No problem for the JBJr.!! 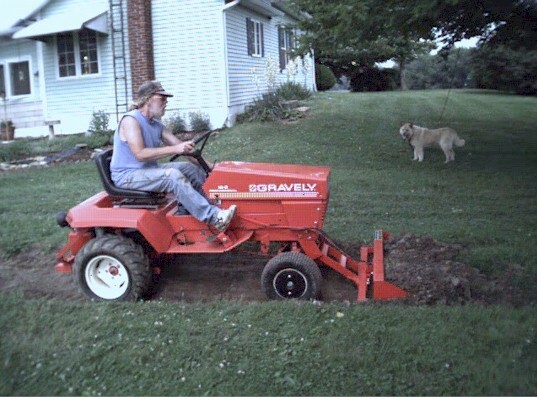 Here at Johnny Products we now have a new respect for the Gravely Machines, or should I say "TANKS"
Special thanks to Al and Andy for sharing these great pictures with us. Great work and keep those pictures coming. 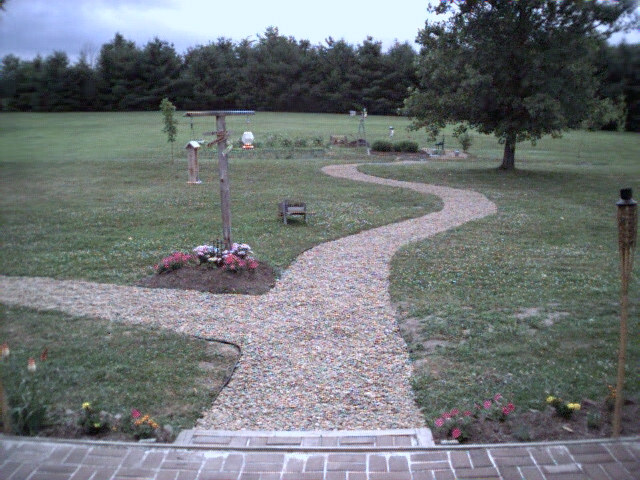 In the next couple of days the gravel will be delivered and Al can start using his new driveway. 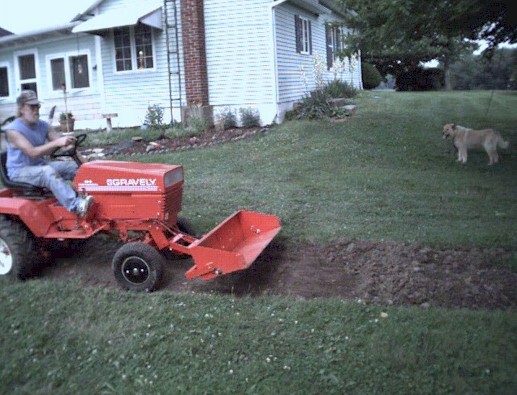 Al received the first JBJr for the Gravely 4 wheel tractor and promptly started using it to remove loose rototilled dirt from a path that he is later going to add stone to. Below is the letter he wrote. I received the Johnny Bucket this afternoon. Got it on and have about 1/4 of the path cleaned out. Works just fine! Had my wife take a couple pictures of me using it. Hope other people like it as well as I do. Definitely a work saver. Just thought I'd let you know. This is what Al did with his Johnny Bucket Jr. in a little over a week. I have our path all done as of yesterday. I put 10 ton of sand in and then 8 ton of gravel. What a work saver! I'm glad I got this, otherwise I would have been doing this with a shovel and wheel barrow. It only took me 2 hours to get the 8 ton of gravel in there yesterday. The wife is happy now! Many Thanks to Al from Johnny Products who helped make this possible. 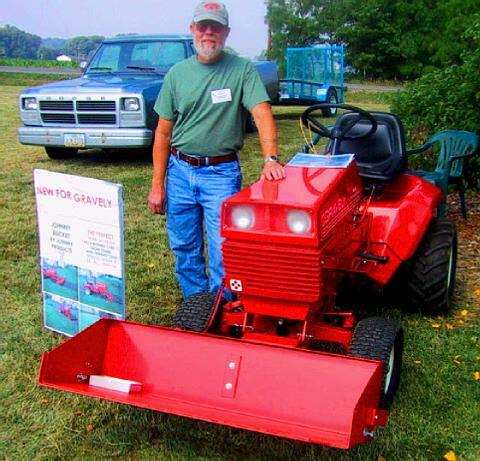 Tom A. with his Wheelhore 314 and his new JBJr. Tom Sent Us this email. I got the bucket on and tried a little digging with it this morning. 8*) I was rather surprised how much I could scoop up, nearly filling the bucket with only the wheel weights and turf tires. I'm 175lbs so it not some other hidden weight that seems to be doing the trick. 8*) I do have chains that I could try if I needed them, but I don't think I will need them from what I can see. 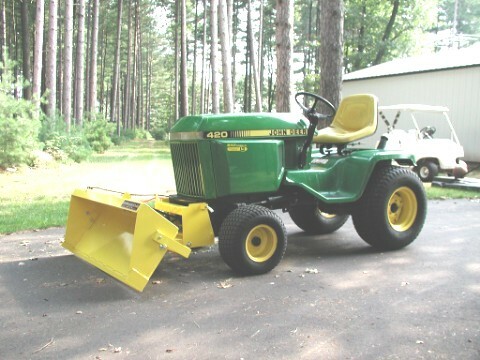 I found that if I have the throttle set at about 1/3 and transmission in high first gear, I can get a good scoop of dirt. 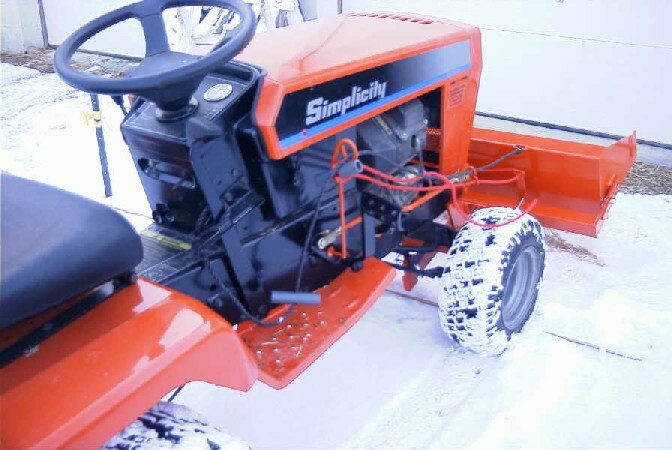 Of course the tires will lose their grip and start to spin just as the bucket fills up. With a bit of timing, I will lift the bucket just before the tire start to spin. 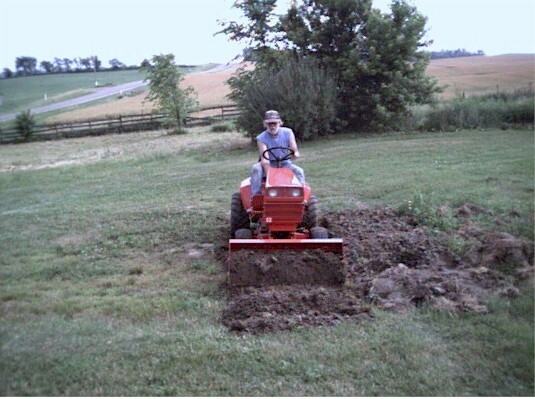 If my timing is slow, the tires spin and I get so much dirt in the bucket that I can't lift the bucket with the manual lift without lifting myself off the seat. When I do get a scoop of dirt and then dump it, I found it quicker and easier to just lower the bucket to the ground while slowly backing up to reset the bucket. 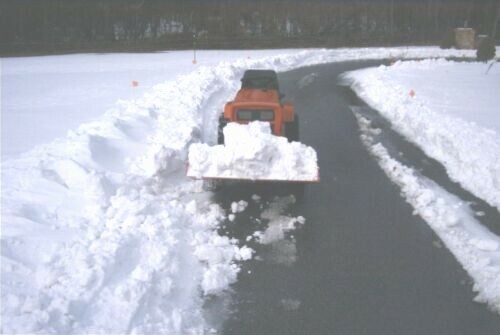 It fits well with the flow of dumping, pushing forward a bit to build up a pile, then backing away from it and reset the bucket. The .jpg on the right is under my deck. I need to take out some of the dirt so I can put in some gravel. In a few minutes, I got the area shown, about 22'x8', down about 3-4 inches. There were a number of rocks I also dug out. You can see part of one on the pile just to the left. I have several potholes, if you will, from other rocks removed from the area where I removed the dirt. You might call it abuse but I had the bucket tripped and I pushed down on the lift handle to dig deeper than I could with the bucket flat. 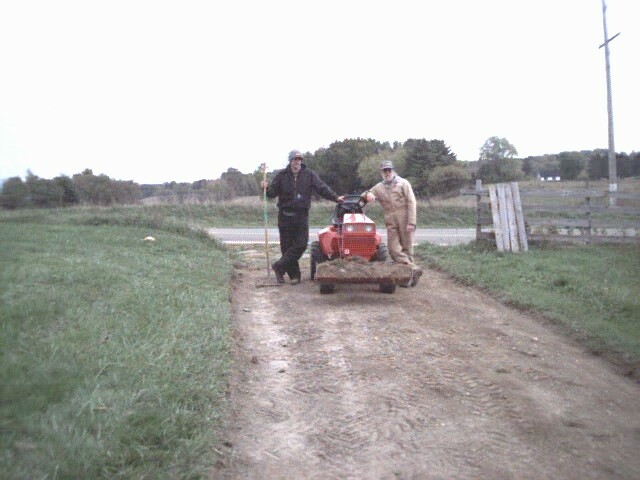 But the JB jr came through unscathed, the other pictures of the tractor were taken after I finished my little test. Well, that might be it for a while. I would like to try some more adjustments this weekend, but I have other chores that will need my attention. Thanks again for making such a great product. The JBJr is working better than I had thought it would. I thought that I was going to have problems getting a full bucket and lifting it with the manual lift. But that doesn't appear to be the case. I can see that the manual lift could be a real workout for a very big job. If I get some time next week I will try some more experiments and let you know how it goes. Jim B. with his AC 314 and his new JBJr. 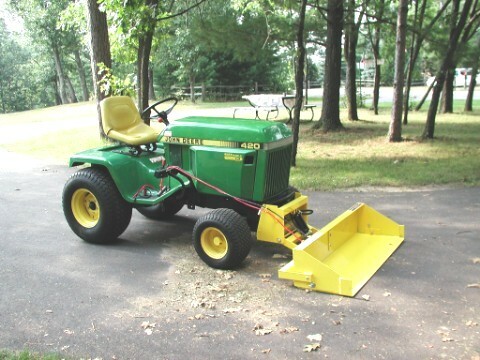 Jerry R. this his John Deere 420 and his new JBJr. 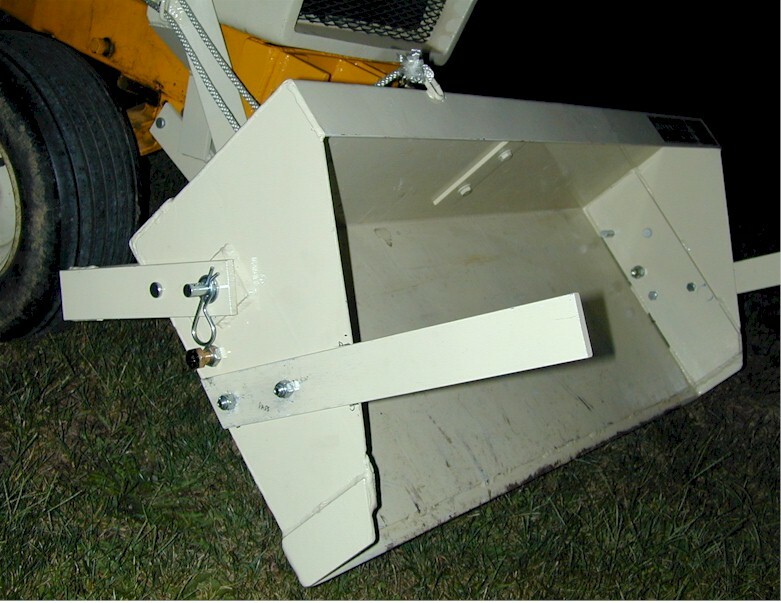 1) Bucket was reinforced at bottom back edge (not in picture) with 3/16 x 3"
angle, and inside side plates with 3/8" x 5" plate. side plate edges. Haven't found yet the grade of steel used, though. 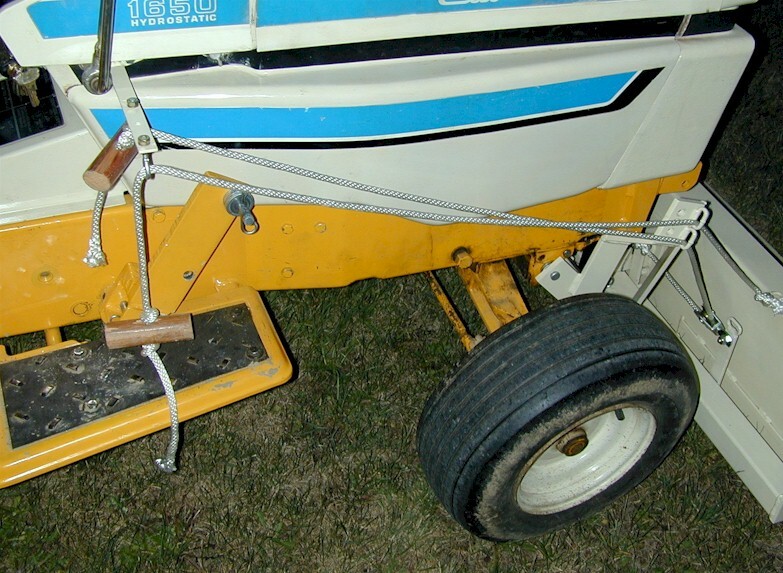 may add some removable front forks to move logs, etc. - the factory ropes wore through at rub points. 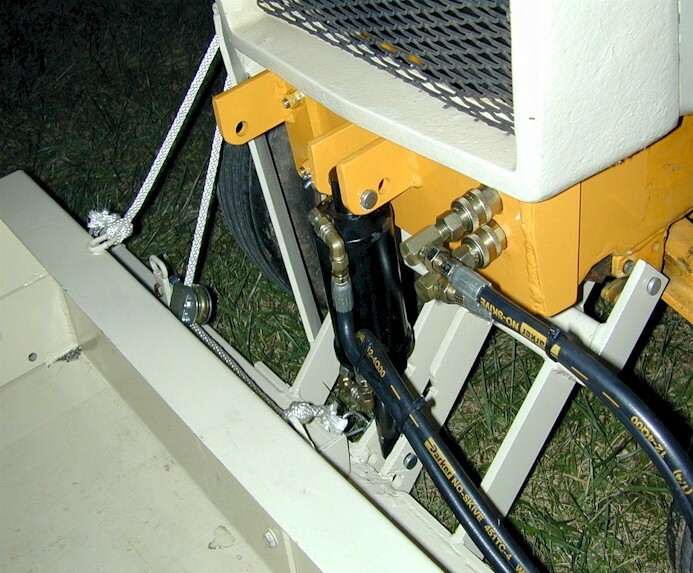 pull force needed to release bucket. 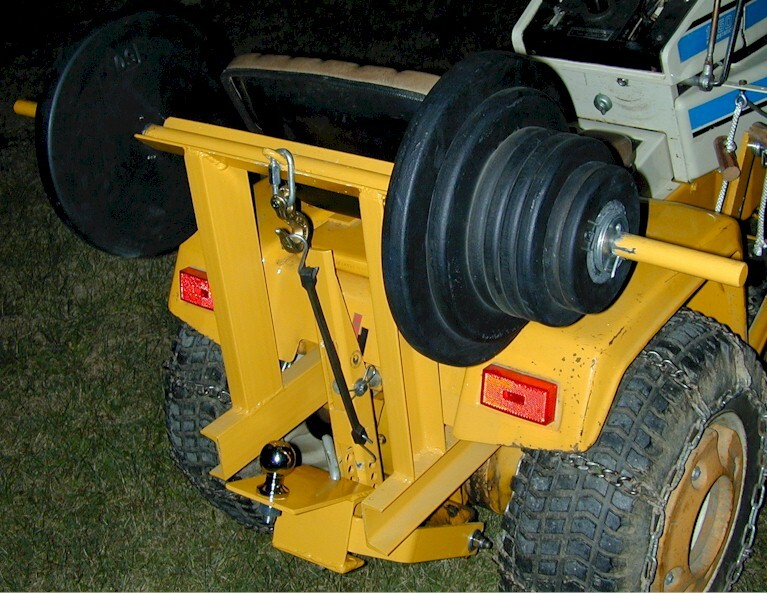 8) Added rear wheel weight to counter balance increased lift capacity.